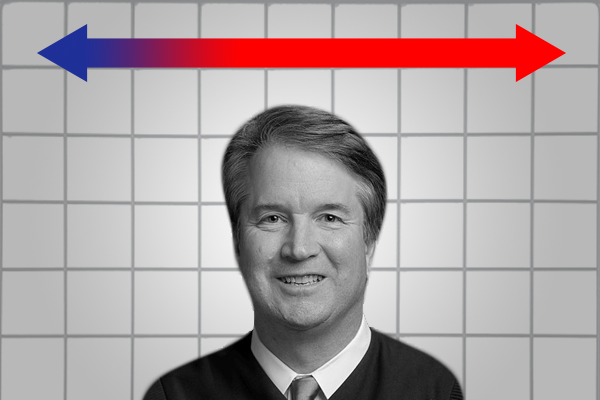 Trump has announced that Brett Kavanaugh is his selection for the next Supreme Court Justice, making him likely to be the 114th Supreme Court Justice. Already, the Supreme Court has used its power to gut the Voting Rights Act, severely limit the Affordable Care Act’s Medicaid expansion, allow massive corporate pollution, allow Republicans to go forward with racist gerrymanders and dismantle unions. Under a court where John Roberts is the swing justice, it’s undoubtable the Court would be willing to go further, solidifying concerns of a new “Lochner Era” in which the Court began striking down laws from democratically elected politicians designed to protect the well-being of workers. In addition, abortion rights will be quickly eroded even further and abortion may become banned in some states. To vizualize the ideological implications of Kavanaugh's addition to the Supreme Court, Data for Progress used a political science methodology called Judicial Common Space. For comparison purposes, we show a hypothetical court in which Merrick Garland was added to the Supreme Court. The line denotes the mean Common Space score, the shading indicates the median justice (Kennedy in the current court, Breyer in a court where Garland is nominated and Roberts in a court where Kavanaugh is nominated). See below for a full methodology. The Judicial Common Space measures are intended to be comparable to DW-NOMINATE (or NOMINATE), a traditional measure of roll call voting of Members of Congress. Clearly, any attempt to compare judges to politicians, or even put ideology on a one-dimensional scale, will be fraught. However, we can get a rough sense of how ideology compares across branches. We used the most recent Judicial Common Space scores, which are from 2016. It is worth noting that Kennedy signed onto more right-wing decisions in his last term (such as Epic Systems and Janus) so the measure may overstate his liberalism. However, these scores can give us a rough comparison between the Judicial, Executive and Legislative branches. The model created by Epstein et al. has the equation CS = (2/π)arctan(-.1736+.461MQ), where CS is Common Space score and MQ is MQ score. This model is used to convert MQ scores into JCS scores for current or former Supreme Court Justices, while the NOMINATE Common Space scores derived as described above are used to create JCS scores for other members of the federal judiciary. (Epstein et al. 2007) For Data for Progress’ purposes, Epstein’s data containing JCS scores for Supreme Court Justices and lower court judges through the end of 2016 were used, and NOMINATE Common Space scores from Lewis et al.’s Voteview data were used for judges not in Epstein’s data. (Epstein 2018) (Lewis et al. 2017) Lewis et al.’s Voteview data were also used for the NOMINATE scores for other politicians used in Data for Progress’ analyses and visualizations. It is worth noting that Donald Trump does not have a NOMINATE score as he has no voting record prior to assuming the Presidency in January 2017, and he was thus not included in our analyses. R statistical software was used for data management and analysis, and Tableau ® was used for data visualization. Sign up for the Data For Progress Newsletter.